For the river called Rahway, see Rahway River. City in Union County, New Jersey, U.S.
Rahway highlighted in Union County. Inset: location of Union County highlighted in the State of New Jersey. Rahway /ˈrɔːweɪ/ is a city in southern Union County, New Jersey, United States. It is part of the New York metropolitan area, 21.6 miles (34.8 km) southwest of Manhattan and 5 miles (8.0 km) west of Staten Island. As of the 2010 United States Census, the city's population was 27,346, reflecting an increase of 846 (+3.2%) from the 26,500 counted in the 2000 Census, which had in turn increased by 1,175 (+4.6%) from the 25,325 counted in the 1990 Census. Rahway and the surrounding area were once the home of the Lenni Lenape Native Americans, and tradition states that the city was named after Rahwack, a local tribal chief. Formal European settlement began in 1664 with the purchase by the English from the Lenape of the Elizabethtown Tract, which encompassed lands from the mouth of the Raritan River and included all of present-day Union County as well as parts of Somerset, Middlesex, Morris and Essex counties. The Seventeenth Century Clark House is one of the oldest buildings in the state. Rahway saw action during the American Revolutionary War because of its proximity to Staten Island, Elizabethtown and Perth Amboy. In January 1777, rebels were victorious against the British in the Battle of Spanktown, which resulted in the death of some 100 British troops. The battle was named this after Rahway's original name given to it by the first settlers, Spanktown, which is said to have been chosen "because an early settler publicly took his spouse across his knee and chastised her". entertained at the inn kept by Samuel Smith by gentlemen of the town. Following the Revolution, Rahway became the home of the first national mint to create a coin bearing the inscription E pluribus unum. A United States Post Office established in Rahway was one of only six in the entire state in 1791. 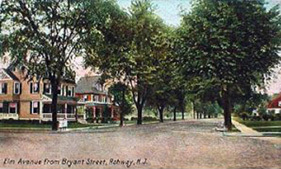 Rahway grew due to its location along the major stagecoach and railroad lines between New York City and Philadelphia, Pennsylvania. The navigable Rahway River, which flows through the city, also aided the city's commercial growth. As immigrants from Britain, Ireland and Germany streamed into what was then Rahway Township in the 1850s, Rahway became incorporated as a city by an act of the State Legislature on April 19, 1858, from portions of Rahway Township in Union and Woodbridge Township in Middlesex County. In 1860, the portion of Rahway that had been part of Middlesex County was transferred to Union. On March 13, 1861, the remainder of Rahway Township became part of Rahway City. Clark Township was formed from portions of the city on March 23, 1864. The first municipal elections for the mayor and council were conducted on April 19, 1858, and the council held its first meeting on May 3, 1858. The city's police department and its initial group of four constables were created at that first council meeting. The city became home to dozens of major manufacturers, including the Regina Music Box Company, Wheatena, Mershon Bros. and, most importantly, Merck & Co., which was established in Rahway in 1903, when George Merck moved his small chemical company to Rahway from New York City. The company remained in Rahway through the presidency of George W. Merck and after. The national decline in industry after World War II led to the closure of most of Rahway's major manufacturing facilities (except for Merck) and a general deterioration of the city's central business district. Beginning in the late 1990s, the city launched a plan to revitalize the downtown area and authorized the construction of hundreds of new market-rate housing units, a hotel, art galleries and additional retail space. According to the United States Census Bureau, Rahway had a total area of 4.028 square miles (10.434 km2), including 3.897 square miles (10.094 km2) of land and 0.131 square miles (0.340 km2) of water (3.26%). Rahway is bordered to the northwest by Clark, to the northeast by Linden and to the south by Woodbridge Township in Middlesex County. The Rahway River travels through Rahway, entering from Clark at Rahway River Parkway. The river receives the waters of Robinsons Branch at Elizabeth Avenue between West Grand Avenue and West Main Street, and then receives the waters of the South Branch at East Hazlewood Avenue and Leesville Avenue. The river leaves Rahway at the city limits of Linden and Woodbridge before flowing into the Arthur Kill. Unincorporated communities, localities and place names located partially or completely within the city include Inman Heights and North Rahway. The climate in this area is characterized by hot, humid summers and generally mild to cool winters. According to the Köppen Climate Classification system, Rahway has a humid subtropical climate, abbreviated "Cfa" on climate maps. As of the 2010 United States Census, there were 27,346 people, 10,533 households, and 6,814.851 families residing in the city. The population density was 7,016.8 per square mile (2,709.2/km2). There were 11,300 housing units at an average density of 2,899.5 per square mile (1,119.5/km2). The racial makeup of the city was 52.30% (14,301) White, 30.93% (8,457) Black or African American, 0.31% (84) Native American, 4.30% (1,175) Asian, 0.02% (5) Pacific Islander, 8.37% (2,288) from other races, and 3.79% (1,036) from two or more races. Hispanic or Latino of any race were 23.52% (6,433) of the population. There were 10,533 households out of which 28.1% had children under the age of 18 living with them, 42.4% were married couples living together, 16.8% had a female householder with no husband present, and 35.3% were non-families. 29.5% of all households were made up of individuals, and 11.2% had someone living alone who was 65 years of age or older. The average household size was 2.58 and the average family size was 3.23. In the city, the population was spread out with 21.8% under the age of 18, 8.5% from 18 to 24, 28.6% from 25 to 44, 27.5% from 45 to 64, and 13.5% who were 65 years of age or older. The median age was 38.8 years. For every 100 females there were 91.1 males. For every 100 females ages 18 and older there were 87.1 males. The Census Bureau's 2006-2010 American Community Survey showed that (in 2010 inflation-adjusted dollars) median household income was $58,551 (with a margin of error of +/- $3,355) and the median family income was $77,268 (+/- $9,506). Males had a median income of $56,572 (+/- $3,375) versus $47,832 (+/- $3,542) for females. The per capita income for the city was $28,855 (+/- $1,981). About 5.4% of families and 8.7% of the population were below the poverty line, including 10.9% of those under age 18 and 9.4% of those age 65 or over. As of the 2000 United States Census there were 26,500 people, 10,028 households, and 6,728 families residing in the city. The population density was 6,642.7 people per square mile (2,564.3/km2). There were 10,381 housing units at an average density of 2,602.2 per square mile (1,004.5/km2). The racial makeup of the city was 60.19% White, 27.07% African American, 0.16% Native American, 3.58% Asian, 0.05% Pacific Islander, 5.62% from other races, and 3.33% from two or more races. Hispanic or Latino people of any race were 13.87% of the population. There were 10,028 households out of which 30.0% had children under the age of 18 living with them, 46.7% were married couples living together, 15.6% had a female householder with no husband present, and 32.9% were non-families. 28.0% of all households were made up of individuals and 11.7% had someone living alone who was 65 years of age or older. The average household size was 2.63 and the average family size was 3.24. In the city the population was spread out with 23.9% under the age of 18, 7.8% from 18 to 24, 32.0% from 25 to 44, 21.8% from 45 to 64, and 14.5% who were 65 years of age or older. The median age was 37 years. For every 100 females, there were 91.2 males. For every 100 females age 18 and over, there were 86.5 males. The median income for a household in the city was $50,729, and the median income for a family was $61,931. Males had a median income of $41,047 versus $32,091 for females. The per capita income for the city was $22,481. About 5.4% of families and 7.1% of the population were below the poverty line, including 9.3% of those under age 18 and 8.2% of those age 65 or over. Beginning in the early 1990s and continuing through the present day, the City of Rahway has rebounded as its downtown began to see the construction of new restaurants, art galleries, market-rate housing and the old Rahway Theatre reopening as the Union County Performing Arts Center. The theater underwent a $6.2-million renovation and expansion project, completed in 2007. As part of the expansion, the facility was purchased by the County of Union for $1.3 million and leased back for $1 a year. In September 1999, remnants of Hurricane Floyd swept across New Jersey and caused severe damage. The Rahway Public Library was on a flood plain and suffered over US$1 million in flood damage. The building was demolished in October 2001 and a new library was constructed and opened on March 22, 2004, behind the city's municipal building along a less flood-prone area of the Rahway River. The area where the former Rahway Public Library was now contains tennis courts and a small playground. East Jersey State Prison, formerly known as Rahway State Prison, actually is located in Woodbridge Township at the border with Rahway. The prison's mailing address is in Rahway, leading many to believe the facility was located there. The prison's official name was changed to East Jersey State Prison as of November 30, 1988, at the request of the citizens of Rahway. East Jersey State Prison is seen at the beginning of the movie Ocean's Eleven, starring George Clooney. The 1978 documentary Scared Straight was filmed there, as was the 1989 movie Lock Up, starring Sylvester Stallone. The prison was briefly mentioned in John Sayles City of Hope (1991). Rahway is home to the Union County Performing Arts Center. It is in the process of building dedicated artists' housing so that actors, musicians, dancers, comedians, poets, filmmakers, and visual artists can live in safe affordable housing. A number of contemporary art galleries sit in the Rahway Arts District as well as three professional rehearsal and recording studios. Rahway River Park hosts a number of baseball fields, picnic areas, a lake and a public pool. The park was designed by the Olmsted Brothers in 1922 and its swimming pool, built in 1929, was documented by the Historic American Engineering Record in 1985. The Rahway River Parkway is a greenway of parkland that hugs the Rahway River and its tributaries. It was designed in the 1920s by the Olmsted Brothers firm, who were the sons of the eminent landscape architect Frederick Law Olmsted. A mysterious duo known as the "Bushman of Rahway" are reported to frequent the Rahway River Parkway disguised as talking bushes. Dressed in ghillie suits, the pair stand up and say 'Hi' to unsuspecting passers-by. Their actions have generated local and international controversy. While some find their prank humorous, local law enforcement have threatened them with arrest if caught. The City of Rahway is governed under the Faulkner Act system of municipal government under the Mayor-Council (Plan F), implemented as of January 1, 1955, based on the recommendations of a Charter Study Commission. Under the City of Rahway's form of government, all executive and administrative authority is vested in the office of the mayor, who appoints the Business Administrator and department directors. The Business Administrator develops an annual budget for the city, manages the city's departments and oversees its employees. This form of government gives citizens a centralized line of authority for the efficient management of the city's business. There are nine members of the Municipal Council, all elected to four-year terms of office. Six members of the council are elected from each of six wards. The other three members are elected to represent the entire city at large, and come up for election at the same time as the mayor two years after the ward seats are up for election. As of 2018[update], the mayor of Rahway is Democrat Raymond A. Giacobbe Jr., who was appointed in January 2017 to serve an unexpired term of office ending December 31, 2018. Members of the Municipal Council are Council President David Brown (Fourth Ward; D, 2020), Council Vice President Rodney Farrar (First Ward; D, 2020), James E. Baker (At Large; D, 2018), Robert "Bob" C. Bresenhan Jr. (Third Ward; D, 2020), Michael W. Cox (Second Ward; D, 2020), Joseph D. Gibilisco (Sixth Ward; D, 2020 - appointed to serve an unexpired term), Joanna Miles (At Large; D, 2018), Jeremy E. Mojica (At Large; D, 2018) and Jennifer Wenson-Maier (Fifth Ward; D, 2020). In January 2018, the council selected Council President Raymond Giacobbe to fill the seat that had been held by Samson Steinman until he resigned the previous month, citing personal reasons. Later that month, Joseph Gibilisco was appointed to fill the sixth ward seat expiring in December 2020 that had been held by Giacobbe that became vacant when he took office as mayor. Steinman had been appointed to the position of mayor in September 2013 following the resignation of Rick Proctor, whose term of office was to have run until December 31, 2014. In turn, the city council chose Raymond A. Giacobbe Jr., from among three candidates nominated by the Democratic municipal committee to fill Steinman's vacant Sixth Ward seat expiring in December 2016. Giacobbe served on an interim basis until the November 2014 general election, when he was elected to serve the balance of the term of office. Rahway is located in the 10th Congressional District and is part of New Jersey's 22nd state legislative district. For the 116th United States Congress, New Jersey's Tenth Congressional District is represented by Donald Payne Jr. (D, Newark). New Jersey is represented in the United States Senate by Democrats Cory Booker (Newark, term ends 2021) and Bob Menendez (Paramus, term ends 2025). For the 2018–2019 session (Senate, General Assembly), the 22nd Legislative District of the New Jersey Legislature is represented in the State Senate by Nicholas Scutari (D, Linden) and in the General Assembly by Linda Carter (politician) (D, Plainfield) and James J. Kennedy (D, Rahway). Carter was appointed in May 2018 to fill the vacant seat left following the death of Jerry Green the previous month after 26 years of service. The Governor of New Jersey is Phil Murphy (D, Middletown Township). The Lieutenant Governor of New Jersey is Sheila Oliver (D, East Orange). Union County is governed by a Board of Chosen Freeholders, whose nine members are elected at-large to three-year terms of office on a staggered basis with three seats coming up for election each year, with an appointed County Manager overseeing the day-to-day operations of the county. At an annual reorganization meeting held in the beginning of January, the board selects a Chairman and Vice Chairman from among its members. As of 2014[update], Union County's Freeholders are Chairman Christopher Hudak (D, Linden, term ends December 31, 2014), Vice Chairman Mohamed S. Jalloh (D, Roselle, 2015), Bruce Bergen (D, Springfield Township, 2015), Linda Carter (D, Plainfield, 2016), Angel G. Estrada (D, Elizabeth, 2014), Sergio Granados (D, Elizabeth, 2016), Bette Jane Kowalski (D, Cranford, 2016), Alexander Mirabella (D, Fanwood, 2015) and Vernell Wright (D, Union, 2014). Constitutional officers elected on a countywide basis are County Clerk Joanne Rajoppi (D, Union, 2015), Sheriff Ralph Froehlich (D, Union, 2016) and Surrogate James S. LaCorte (D, Springfield Township, 2014). The County Manager is Alfred Faella. As of March 23, 2011, there were a total of 15,719 registered voters in Rahway, of whom 7,159 (45.5% vs. 41.8% countywide) were registered as Democrats, 1,675 (10.7% vs. 15.3%) were registered as Republicans and 6,880 (43.8% vs. 42.9%) were registered as Unaffiliated. There were 5 voters registered to other parties. Among the city's 2010 Census population, 57.5% (vs. 53.3% in Union County) were registered to vote, including 73.5% of those ages 18 and over (vs. 70.6% countywide). In the 2012 presidential election, Democrat Barack Obama received 8,413 votes (74.7% vs. 66.0% countywide), ahead of Republican Mitt Romney with 2,648 votes (23.5% vs. 32.3%) and other candidates with 107 votes (0.9% vs. 0.8%), among the 11,269 ballots cast by the city's 16,730 registered voters, for a turnout of 67.4% (vs. 68.8% in Union County). In the 2008 presidential election, Democrat Barack Obama received 8,340 votes (69.8% vs. 63.1% countywide), ahead of Republican John McCain with 3,410 votes (28.5% vs. 35.2%) and other candidates with 115 votes (1.0% vs. 0.9%), among the 11,944 ballots cast by the city's 16,039 registered voters, for a turnout of 74.5% (vs. 74.7% in Union County). In the 2004 presidential election, Democrat John Kerry received 6,512 votes (63.1% vs. 58.3% countywide), ahead of Republican George W. Bush with 3,668 votes (35.5% vs. 40.3%) and other candidates with 92 votes (0.9% vs. 0.7%), among the 10,326 ballots cast by the city's 14,471 registered voters, for a turnout of 71.4% (vs. 72.3% in the whole county). In the 2013 gubernatorial election, Democrat Barbara Buono received 55.4% of the vote (3,211 cast), ahead of Republican Chris Christie with 43.0% (2,494 votes), and other candidates with 1.6% (93 votes), among the 5,934 ballots cast by the city's 16,359 registered voters (136 ballots were spoiled), for a turnout of 36.3%. In the 2009 gubernatorial election, Democrat Jon Corzine received 3,961 ballots cast (57.4% vs. 50.6% countywide), ahead of Republican Chris Christie with 2,451 votes (35.5% vs. 41.7%), Independent Chris Daggett with 366 votes (5.3% vs. 5.9%) and other candidates with 68 votes (1.0% vs. 0.8%), among the 6,895 ballots cast by the city's 15,842 registered voters, yielding a 43.5% turnout (vs. 46.5% in the county). The Rahway Public Schools serve students in pre-kindergarten through twelfth grade. As of the 2011–12 school year, the district's six schools had an enrollment of 3,858 students and 294.8 classroom teachers (on an FTE basis), for a student–teacher ratio of 13.09:1. Schools in the district (with 2011–12 enrollment data from the National Center for Education Statistics) are four Pre-K–6 elementary schools (which had been Pre-K–5 until 2011)—Grover Cleveland School (343 students), Franklin School (564), Madison School (308) and Roosevelt School (665)—Rahway 7th & 8th Grade Academy (845) for grades 7–8 and Rahway High School (1,133) for grades 9–12. As of 2010, the city had a total of 73.67 miles (118.56 km) of roadways, of which 59.18 miles (95.24 km) were maintained by the municipality, 10.45 miles (16.82 km) by Union County and 4.04 miles (6.50 km) by the New Jersey Department of Transportation. Rahway is served by U.S. Route 1/9, and Route 27. The city is sandwiched between the Garden State Parkway and the New Jersey Turnpike, which are each located about two miles outside of the city limits. There are several crossings of the Rahway River in the city. NJ Transit 115 route provides local service and interstate service to and from the Port Authority Bus Terminal in Midtown Manhattan, with service on the 48 line to Elizabeth and Perth Amboy. Rahway Train Station serves NJ Transit's North Jersey Coast Line and Northeast Corridor Line. The City of Rahway and NJ Transit helped fund a $16 million renovation for the station in 1999 and a public plaza in front of the station was completed in 2001, changes that have spurred cleanup and revitalization downtown. A new US$11.2 million 524-space parking deck opened across the street from the station in January 2005, helping train commuters and allowing the city to transform old parking lot space into new buildings and residences. A typical train ride to New York City's Pennsylvania Station takes 40 minutes. Newark Liberty International Airport is 10.2 miles (16.4 km) northeast of Rahway, approximately a 20-minute drive by car. See also: Category:People from Rahway, New Jersey. Alfred M. Gray Jr. (born 1928), 29th Commandant of the Marine Corps, from July 1, 1987 to June 30, 1991. Marques Townes (born 1995), basketball player for the Loyola Ramblers men's basketball team, who transferred out of Cardinal McCarrick after his sophomore year. Sal Oliveri - #1's on Billboard, iTunes, CMT Multi-genre Producer / Artist Development / Songwriter. ^ a b c "City of Rahway". Geographic Names Information System. United States Geological Survey. ^ a b c d Mayor & Administration, City of Rahway. Accessed February 12, 2018. ^ 2018 New Jersey Mayors Directory, New Jersey Department of Community Affairs. Accessed February 12, 2018. As of date accessed, Steinman is listed as mayor with an incorrect term-end year of 2020. ^ Municipal Clerk, City of Rahway. Accessed February 12, 2018. ^ a b 2012 New Jersey Legislative District Data Book, Rutgers University Edward J. Bloustein School of Planning and Public Policy, March 2013, p. 98. ^ a b c d 2010 Census Gazetteer Files: New Jersey County Subdivisions, United States Census Bureau. Accessed May 21, 2015. ^ a b c d e f DP-1 - Profile of General Population and Housing Characteristics: 2010 Demographic Profile Data for Rahway city, Union County, New Jersey, United States Census Bureau. Accessed May 20, 2012. ^ a b c Table DP-1. Profile of General Demographic Characteristics: 2010 for Rahway city, New Jersey Department of Labor and Workforce Development. Accessed May 20, 2012. ^ 2010 Census Populations: Union County, Asbury Park Press. Accessed May 20, 2012. ^ a b GCT-PH1 Population, Housing Units, Area, and Density: 2010 - State -- County Subdivision from the 2010 Census Summary File 1 for New Jersey, United States Census Bureau. Accessed September 19, 2012. ^ Look Up a ZIP Code for Rahway, NJ, United States Postal Service. Accessed May 20, 2012. ^ Zip Codes, State of New Jersey. Accessed September 14, 2013. ^ Area Code Lookup - NPA NXX for Rahway, NJ, Area-Codes.com. Accessed September 14, 2013. ^ A Cure for the Common Codes: New Jersey, Missouri Census Data Center. Accessed May 20, 2012. ^ Table 7. Population for the Counties and Municipalities in New Jersey: 1990, 2000 and 2010 Archived 2013-05-20 at the Wayback Machine, New Jersey Department of Labor and Workforce Development, February 2011. Accessed July 6, 2012. ^ a b "Rahway" from the Encyclopædia Britannica Eleventh Edition of 1911, accessed January 3, 2007. ^ History, Dr. Wm. Robinson Plantation Museum. Accessed May 22, 2013. ^ History Archived 2005-02-09 at the Wayback Machine, City of Rahway. Accessed November 20, 2012. "In January 1777, the Battle of Spanktown was fought on St. Georges Avenue in the vicinity of Robinson's Branch and the North Branch of the Rahway River. The battle lasted twelve hours with the rebels getting the best of the British, who lost almost one hundred men." ^ Staff. "The Battle of Spanktown; Early History of Rahway and Its Environs", The New York Times, February 21, 1897. Accessed November 20, 2012. "The Rahway of to-day is what was known in the last century as Spanktown, the name having been given because an early settler publicly took his spouse across his knee and chastised her." ^ Tavern - Merchants & Drovers Tavern, Rahway Archived 2013-07-23 at the Wayback Machine, Art & Architecture of New Jersey, Stockton University. Accessed May 20, 2012. ^ Hill, Raven. "Colonial coin found at old home in Franklin", Home News Tribune, April 13, 2003. Accessed May 20, 2012. "It turned out to be a New Jersey Copper, minted in Rahway or Morristown between 1786 and 1790, the first coins to bear the national motto, 'E Pluribus Unum.'" ^ a b Snyder, John P. The Story of New Jersey's Civil Boundaries: 1606-1968, Bureau of Geology and Topography; Trenton, New Jersey; 1969. p. 194. Accessed May 20, 2012. ^ History Archived 2013-06-15 at Archive.today, Rahway Police. Accessed May 22, 2013. "The Rahway Police Department was officially established on May 3, 1858, at the first meeting of the city council." ^ Staff. "Suitable Site: Albany Merck Plant Targeted for Growth", The Albany Herald, June 14, 1987. "The company launched a manufacturing operation in Rahway, in 1903 where the company headquarters is located today." ^ Areas touching Rahway, MapIt. Accessed April 14, 2015. ^ Significant Habitats And Habitat Complexes Of The New York Bight Watershed - Arthur Kill Complex, United States Fish and Wildlife Service. Accessed May 22, 2013. ^ Locality Search, State of New Jersey. Accessed April 24, 2015. ^ Rahway weather, Weatherbase.com. Accessed October 18, 2013. ^ Compendium of censuses 1726-1905: together with the tabulated returns of 1905, New Jersey Department of State, 1906. Accessed May 21, 2013. ^ Census of Population: 1960: Characteristics of the population. pt. A, United States Census Bureau, p. 32-12. Accessed September 19, 2012. ^ Raum, John O. The History of New Jersey: From Its Earliest Settlement to the Present Time, Volume 1, p. 281, J. E. Potter and company, 1877. Accessed July 29, 2013. "Rahway is divided into four wards. In 1860 the population was 7,130; and in 1870, 6,258. This diminution is caused by the formation of Clark and Linden townships." ^ Staff. A compendium of the ninth census, 1870, p. 259. United States Census Bureau, 1872. Accessed July 29, 2013. ^ Thirteenth Census of the United States, 1910: Population by Counties and Minor Civil Divisions, 1910, 1900, 1890, United States Census Bureau, p. 339. Accessed May 20, 2012. ^ Fifteenth Census of the United States : 1930 - Population Volume I, United States Census Bureau, p. 712. Accessed May 20, 2012. ^ Table 6. New Jersey Resident Population by Municipality: 1930 - 1990 Archived 2015-05-10 at the Wayback Machine, New Jersey Department of Labor and Workforce Development. Accessed June 28, 2015. ^ a b c d e Census 2000 Profiles of Demographic / Social / Economic / Housing Characteristics for Rahway city, United States Census Bureau. Accessed May 20, 2012. ^ a b c d e DP-1: Profile of General Demographic Characteristics: 2000 - Census 2000 Summary File 1 (SF 1) 100-Percent Data for Rahway city, New Jersey, United States Census Bureau. Accessed July 6, 2012. ^ DP03: Selected Economic Characteristics from the 2006-2010 American Community Survey 5-Year Estimates for Rahway city, Union County, New Jersey, United States Census Bureau. Accessed May 20, 2012. ^ About Us, Union County Performing Arts Center. Accessed May 20, 2012. ^ Russell, Suzanne C. "Rahway FEMA action closes books on Rahway's flood-damaged library", Home News Tribune, November 14, 1999. Accessed May 20, 2012. "The flood-damaged Rahway Public Library will never reopen at the St. Georges Avenue building because Federal Emergency Management Agency officials have deemed the damage too severe. Instead, a new library and technology center are planned by the city for the 40,000-square-foot SDI Technologies building on Main Street, Rahway officials said." ^ Malwitz, Rick. "What's in a name? Plenty if we're talking prison", Home News Tribune, February 15, 2001. Accessed May 20, 2012. "The name was officially changed to East Jersey State Prison Nov. 30, 1988." ^ What's in a name? Plenty if we're talking prison, Home News Tribune, February 15, 2001. ^ Parks, Activities, Locations & Maps, Union County, New Jersey. Accessed November 26, 2016. ^ Madison Avenue Park, Union County, New Jersey. Accessed November 26, 2016. ^ Milton Lake Park, Union County, New Jersey. Accessed November 26, 2016. ^ Rahway River Park map Archived 2013-07-23 at the Wayback Machine, Union County, New Jersey Department of Parks and Community Renewal. Accessed May 20, 2012. ^ Yearby, Jean P. Rahway River Park, Swimming Pool, Historic American Engineering Record, Library of Congress. Accessed April 14, 2015. ^ The Inception of a Parkway, Friends of Rahway River Parkway. Accessed November 26, 2016. ^ "Should the pranksters behind the scary, fake bushes in this park be arrested? (VIDEO)". NJ.com. Retrieved 2017-10-30. ^ "Teens Disguised as Talking Bushes Are Tearing a Small Town Apart". Vice. 2017-10-28. Retrieved 2017-10-30. ^ "The Faulkner Act: New Jersey's Optional Municipal Charter Law", New Jersey State League of Municipalities, July 2007. Accessed October 16, 2013. ^ Rahway City Council, City of Rahway. Accessed August 4, 2016. ^ Municipal Council Members, City of Rahway. Accessed February 12, 2018. ^ 2017 Municipal User Friendly Budget, City of Rahway]. Accessed February 12, 2018. ^ Union County 2017 Directory, Union County, New Jersey. Accessed February 12, 2018. As of date accessed, resignation of Steinman as mayor is not reflected. ^ Elected Officials, Union County, New Jersey. Accessed August 3, 2016. ^ General Election November 8, 2016 Official Results, Union County, New Jersey, updated November 14, 2016. Accessed January 30, 2017. ^ a b November 4, 2014 General Election Official Results, Union County, New Jersey, updated January 7, 2015. Accessed August 3, 2016. ^ Iati, Marisa. "Cursed seat? After back-to-back mayors resign suddenly, 3rd takes over", NJ Advance Media for NJ.com, January 9, 2018. Accessed February 12, 2018. "Rahway got its third top executive in less than five years Monday after former Mayor Samson Steinman resigned suddenly on Christmas Eve, citing personal issues.The council unanimously selected council President Raymond Giacobbe Jr. to serve the last year of Steinman's term, the city clerk said. Steinman stepped down Dec. 24 after three years in office, the last 16 months of which saw him twice crash a city car, go on medical leave to resolve then-unspecified issues and later publicly come out as bipolar." ^ Staff. "Joseph Gibilisco appointed to City Council", NJToday.net, January 25, 2018. Accessed February 12, 2018. "The Rahway City Council unanimously appointed Joseph D. 'Joe' Gibilisco to the governing body during a special meeting held to fill a vacant seat. The Sixth Ward vacancy was created when the governing body approved then-Council President Raymond Giacobbe, Jr. to serve the remaining year in the mayoral term of Samson Steinman, who resigned on Christmas Eve after an eventful year." ^ Khavkine, Richard. "Rahway Mayor Rick Proctor resigns post after 32 turbulent months", The Star-Ledger, September 11, 2013. Accessed September 14, 2013. "With a single-sentence resignation letter, Rick Proctor has ended his tumultuous 32-month tenure as mayor of Rahway, effective immediately.... Council president Samson Steinman, a one-time political ally but more recently a frequent Proctor adversary, has been named acting mayor." ^ Staff. "Giacobbe picked to replace Steinman on Council", NJToday.net, October 8, 2013. Accessed October 16, 2013. "Raymond A. Giacobbe Jr., of 439 Harbienko Court, was appointed as the Sixth Ward's new representative when the City Council held a special meeting Tuesday immediately after Rahway Democrats offered his name among three contenders for the spot. Giacobbe, 34, was nominated as councilman to replace Mayor Samson Steinman, who resigned from the governing body when he was named to his current position following the unexpected departure of embattled former Mayor Rick Proctor." ^ 2017 New Jersey Citizen's Guide to Government Archived 2017-04-07 at the Wayback Machine, p. 63, New Jersey League of Women Voters. Accessed May 30, 2017. ^ District 22 Legislators, New Jersey Legislature. Accessed January 22, 2018. ^ Russell, Suzanne. "Linda Carter sworn into General Assembly, replacing Jerry Green", Courier News, May 24, 2018. Accessed July 3, 2018. "Former Union County Freeholder Linda Carter was sworn into the New Jersey General Assembly on Thursday, representing the 22nd Legislative District communities in Middlesex, Somerset and Union counties.... Carter replaces Assemblyman Jerry Green, 79, of Plainfield, who died April 18. Green served 26 years in the assembly." ^ County Government, Union County, New Jersey. Accessed January 26, 2014. ^ Freeholder Christopher Hudak, Union County, New Jersey. Accessed January 26, 2014. ^ Freeholder Mohamed S. Jalloh, Union County, New Jersey. Accessed January 26, 2014. ^ Bruce Bergen, Union County, New Jersey. Accessed January 26, 2014. ^ Freeholder Vice Chairman Linda Carter, Union County, New Jersey. Accessed January 26, 2014. ^ Freeholder Angel G. Estrada, Union County, New Jersey. Accessed January 26, 2014. ^ Freeholder Sergio Granados, Union County, New Jersey. Accessed January 26, 2014. ^ Freeholder Bette Jane Kowalski, Union County, New Jersey. Accessed January 26, 2014. ^ Freeholder Alexander Mirabella, Union County, New Jersey. Accessed January 26, 2014. ^ Freeholder Vernell Wright, Union County, New Jersey. Accessed January 26, 2014. ^ Board of Chosen Freeholders, Union County, New Jersey. Accessed January 26, 2014. ^ Union County Clerk, Joanne Rajoppi, Union County, New Jersey. Accessed January 26, 2014. ^ Union County Sheriff Ralph Froehlich, Union County, New Jersey. Accessed January 26, 2014. ^ Surrogate, Union County, New Jersey. Accessed January 26, 2014. ^ Elected Officials – Clerk – Sheriff – Surrogate, Union County, New Jersey. Accessed January 26, 2014. ^ County Manager, Union County, New Jersey. Accessed January 26, 2014. ^ a b Voter Registration Summary - Union, New Jersey Department of State Division of Elections, March 23, 2011. Accessed May 22, 2013. ^ GCT-P7: Selected Age Groups: 2010 - State -- County Subdivision; 2010 Census Summary File 1 for New Jersey, United States Census Bureau. Accessed May 22, 2013. ^ Presidential November 6, 2012 General Election Results - Union County, New Jersey Department of State Division of Elections, March 15, 2013. Accessed May 22, 2013. ^ Number of Registered Voters and Ballots Cast November 6, 2012 General Election Results - Union County, New Jersey Department of State Division of Elections, March 15, 2013. Accessed May 22, 2013. ^ 2008 Presidential General Election Results: Union County, New Jersey Department of State Division of Elections, December 23, 2008. Accessed May 22, 2013. ^ 2004 Presidential Election: Union County, New Jersey Department of State Division of Elections, December 13, 2004. Accessed May 22, 2013. ^ "Governor - Union County" (PDF). New Jersey Department of Elections. January 29, 2014. Retrieved December 24, 2014. ^ "Number of Registered Voters and Ballots Cast - November 5, 2013 - General Election Results - Union County" (PDF). New Jersey Department of Elections. January 29, 2014. Retrieved December 24, 2014. ^ 2009 Governor: Union County, New Jersey Department of State Division of Elections, December 31, 2009. Accessed May 22, 2013. ^ District information for Rahway School District, National Center for Education Statistics. Accessed June 11, 2014. ^ School Data for the Rahway Public Schools, National Center for Education Statistics. Accessed July 30, 2014. ^ Grover Cleveland School Archived 2013-06-15 at Archive.today, Rahway Public Schools. Accessed July 29, 2013. ^ Franklin School Archived 2013-06-15 at Archive.today, Rahway Public Schools. Accessed July 29, 2013. ^ Madison School Archived 2013-06-15 at Archive.today, Rahway Public Schools. Accessed July 29, 2013. ^ Roosevelt School Archived 2013-06-15 at Archive.today, Rahway Public Schools. Accessed July 29, 2013. ^ Rahway 7th & 8th Grade Academy Archived 2013-06-15 at Archive.today, Rahway Public Schools. Accessed July 29, 2013. ^ Rahway High School, Rahway Public Schools. Accessed July 29, 2013. ^ Our Schools Archived 2013-06-15 at Archive.today, Rahway Public Schools. Accessed July 29, 2013. ^ New Jersey School Directory for the Rahway Public Schools, New Jersey Department of Education. Accessed December 29, 2016. ^ Union County Mileage by Municipality and Jurisdiction, New Jersey Department of Transportation, May 2010. Accessed July 18, 2014. ^ Union county Bus / Rail Connections, NJ Transit, backed up by the Internet Archive as of May 22, 2009. Accessed May 20, 2012. ^ Rahway station, NJ Transit. Accessed October 16, 2013. ^ Northeast Corridor Line, NJ Transit. Accessed October 16, 2013. ^ Martin, Antoinette. "Can a Face Lift Offer a New Identity? ", The New York Times, October 29, 2006. Accessed May 20, 2012. "Rahway's train station, transformed after a $16 million renovation, is in the heart of its compact downtown, offering commuters a direct trip to Penn Station in Manhattan, about 15 miles northeast of here, or to Penn Station in Newark or to Trenton." ^ Russell, Suzanne C. "Rahway parking project on track 524-space deck may open in December", Home News Tribune, July 20, 2004. Accessed May 20, 2012. ^ Juliette Atkinson Archived 2014-08-08 at the Wayback Machine, International Tennis Hall of Fame. Accessed July 30, 2014. ^ Peter Boettke Interview, The Best Schools. Accessed September 21, 2015. "Boettke was born in Rahway, New Jersey, in 1960." ^ New Jersey Aviation History, New Jersey Aviation Hall of Fame. Accessed September 21, 2015. "1909 – Rahway's Boland brothers built and flew the state's first fixed-wing aircraft. They were also the first to fly in South America." ^ Stephenson, Colin. "Rahway's Brandao sisters find soccer success with Portuguese national team", The Star-Ledger, April 10, 2009. Accessed September 21, 2015. "Lissette and Kimberly Brandao rose through the youth soccer ranks in Rahway and were skilled enough to play alongside Heather O'Reilly at the club level and Carli Lloyd at Rutgers." ^ Chris Brantley, NFL.com. Accessed September 21, 2015. ^ Ronald Breslow, Columbia University. Accessed September 21, 2015. "Ronald Breslow was born in Rahway, New Jersey on March 14, 1931." ^ Van Hoesen, Walter Hamilton. Crafts and Craftsmen of New Jersey, p. 70. Fairleigh Dickinson University Press, 1973. ISBN 9780838610800. Accessed September 21, 2015. "Brokaw was born in Raritan, Somerset County, in 1746, and died in 1826.... Isaac began his trade in Elizabeth around 1770 and remained there until 1790, when he removed to Bridge Town, on the south side of the Rahway River, which is now known as Rahway." ^ Hunt, Henry Jackson. Sketch of the Life and Services of Gen. Harvey Brown, U.S. Army, p. 3. Appleton, 1874. Accessed September 21, 2015. ""He was born in Bridgetown, now forming part of the town of Rahway, New Jersey, in 1796." ^ Kania, Joe. "Wrestling: Rahway's Darrion Caldwell wins homecoming fight in Atlantic City", The Star-Ledger, May 3, 2014. Accessed May 30, 2016. "Caldwell, who won three New Jersey state wrestling titles for Rahway just down the boardwalk at Boardwalk Hall, earned a submission in 1:38 over Joe Pingitore to improve to 5-0 on his career and 2-0 since entering the Bellator." ^ Carino, Jerry. "In Jeff Lubreski, Plainfield's loss is Rahway's gain", Courier News, July 1, 2015. Accessed September 21, 2015. "Not that Rahway is a basketball wasteland. The Indians produced Earl Clark and Louis Campbell, among others, and achieved steady success under previous coach Kevin Conroy." ^ Staff. "Case: Eisenhower Stalwart and McCarthy Foe; Republican Nominee for Senate Big Vote Getter in Jersey", The New York Times, October 28, 1954. Accessed April 15, 2011. "Clifford P. Case of Rahway is a lean scholarly looking man, whose quiet manner, philosophical speeches and natural inclination for unostentatious campaigning hardly fit the mold of political orthodoxy." ^ Staff. "House Of Abraham Clark, A Signer, Will Be Rebuilt; Duplicate of Rahway Home to Memorialize Him and Two Sons as Revolutionary Patriots", The New York Times, February 6, 1927. Accessed September 21, 2015. "Abraham Clark, one of the signers of the Declaration of Independence, is to be honored by the erection of a memorial house in his home town, Rahway, N.J."
^ Earl Clark Archived 2011-02-21 at the Wayback Machine, University of Louisville. Accessed June 17, 2009. ^ McCullough, Andy. Rahway's Earl Clark picked by Phoenix Suns in first round of NBA Draft", The Star-Ledger, June 25, 2009. Accessed September 21, 2015. ^ Fowler, Henry. The American Pulpit: Sketches, Biographical and Descriptive, of Living American Preachers, and of the Religious Movements and Distinctive Ideas which They Represent, p. 351. J.M. Fowler, 1856. Accessed September 21, 2015. "They were members of the Society of Friends; were married February 13, 1791; removed from Philadelphia March 23, 1792, to Rahway, New Jersey, where, at Leesville, as now called, Samuel H. Cox was born." ^ American Ancestry. 4. Albany: Joel Munsell's Sons. 1889. p. 210. ^ Wallye. "The story of the Assemblyman who got caught stealing an air conditioner", PolitickerNJ, May 7, 2009. Accessed September 21, 2015. "Arnold D'Ambrosa was the 40-year-old Rahway Democratic Municipal Chairman and Public Works Director when he was elected to the State Assembly in 1973.... In July 1974, six months after taking office, D'Ambrosa was arrested on charges that he sold an air conditioner owned by Rahway for $600, pocketing the money, and he took a $200 bribe from a contractor." ^ Downer, Harry E. History of Davenport and Scott County Iowa: Illustrated, Volume 1, p. 856. S.J. Clarke, 1910. Accessed September 21, 2015. "Acting upon this advice he went to New Jersey and stopped at the pleasant village of Rahway, where he remained some time and then went to Carlisle, Pennsylvania." ^ Sutherland, Emily. "Hall of Honor: Evie", Homecoming magazine, August 1, 2011. Accessed September 21, 2015. "Born: 1957 in Rahway, New Jersey"
^ Bodovitz, Sandra. "'Forgotten' Sculptor Has Day In Gallery", The New York Times, June 15, 1986. Accessed September 21, 2015. "Born in the Union County community of Rahway in 1790, Frazee first demonstrated his novel style by carving tombstones, many of which still dot New Jersey cemeteries." ^ Washington, Ethel M. Union County's Black Soldiers and Sailors of the Civil War, p. 17. The History Press, 2011. ISBN 1596294469. Accessed September 19, 2012. "Ana Maria Weems escaped slavery through the Underground Railroad with the assistance of Rahway-born Amos Noe Freeman." ^ Milton Friedman – Biographical, Nobel Prize. Accessed August 4, 2013. "When I was a year old, my parents moved to Rahway, N.J., a small town about 20 miles from New York City." ^ Slotnik, Daniel E. "Leighton Gage, Crime Novelist, Dies at 71", The New York Times, August 2, 2013. Accessed August 4, 2013. "Leighton Gage was born on May 13, 1942, in Rahway, N.J."
^ Antonio Garay Archived 2007-03-28 at the Wayback Machine, Chicago Bears. Accessed May 17, 2007. "Earned Prep Star All-American and All-New Jersey Group III honors as a senior at Rahway H.S. in Rahway, N.J. after totaling 141 tackles and 10 sacks in his final season... Outstanding wrestler who was tabbed the 275-pound national champion by the National High School Coaches' Association"
^ About Wayne Archived 2007-09-26 at the Wayback Machine, Congressman Wayne Gilchrest. Accessed May 17, 2007. "Born in Rahway, New Jersey, he was the fourth of Elizabeth and Arthur Gilchrest's six boys." ^ Tucker, Spencer C. Persian Gulf War Encyclopedia: A Political, Social, and Military History: A Political, Social, and Military History, p. 175. ABC-CLIO, 2014. ISBN 9781610694162. Accessed November 20, 2017. "Alfred M. Gray Jr. was born on June 22, 1928, at Rahway, New Jersey. Raised in Point Pleasant Beach, New Jersey, he attended Lafayette College but dropped out of school and enlisted in the U.S. Marine Corps in 1950." ^ Kagan, Jerome. An Argument for Mind, p. 4. Yale University Press, 2007. ISBN 9780300126037. Accessed May 30, 2014. "Rahway, New Jersey, a town twenty miles south of New York City, with a population of about twenty thousand in my childhood, had a relatively large working-class population and a small group of Jewish merchants, including my father." ^ Copeland, Libby. "Prison Revolt: Brig. Gen. Janis Karpinski Says the Abu Ghraib Investigation Is About Scapegoating, but She's Having None of It", The Washington Post, May 10, 2004. Accessed April 15, 2011. "As a child growing up in Rahway, N.J., Janis Beam once tried to jump from her second-story window because it didn't seem that far down." ^ Rahway, New Jersey Native, William H. Lash III Appointed as Assistant Secretary for Market Access and Compliance at the U.S. Department of Commerce, International Trade Administration Office of Public Affairs, August 30, 2001. Accessed May 22, 2013. ^ Weber, Bruce. "Dory Previn, Songwriter, Is Dead at 86", The New York Times, February 14, 2012. May 20, 2012. "Dorothy Veronica Langan was born in New Jersey — sources differ on the town, Rahway or Woodbridge — on Oct. 22, 1925, and she grew up in Woodbridge." ^ Goldberg, Marv. "The Concords", Marv Goldberg's Yesterday's Memories Rhythm & Blues Party. Accessed September 21, 2015. "Enter Pearl Reaves, a singer originally from Raleigh, North Carolina, who had moved to Rahway, New Jersey in the late 40s." ^ Kochakian, Dan. "Pearl Reaves", Women, Whiskey and..., December 1985, Issue 15. pp. 25-27. ^ Jordan, Chris. "Rahway's Eric Roberson heads to L.A. for a possible Grammy", Courier News (New Jersey), January 30, 2010. Accessed December 28, 2010. ^ Freddie Russo Archived 2007-10-24 at the Wayback Machine, New Jersey Boxing Hall of Fame. Accessed May 22, 2013. "Freddie Russo was born in Brooklyn, New York on October 3, 1924. His family moved to Rahway, New Jersey and that city became the home base for one of the classiest boxer-punchers of that era." ^ Oral history interview with Carl Sagan, 1991 August 27., American Institute of Physics. Accessed May 22, 2013. ^ Giase, Frank. "NY Red Bulls go for attacking players in MLS draft, trade for veteran defender Chris Albright", The Star-Ledger, January 14, 2010. Accessed November 11, 2017. "The only other player with New Jersey ties taken in the draft was Villanova midfielder Mike Seamon, a Rahway native who attended Union Catholic High." ^ Mark Slonaker, Georgia Bulldogs. Accessed July 12, 2016. "A native of Rahway, N.J., Slonaker lettered for the Bulldogs (1976–79) and was co-captain of coach Hugh Durham's first team at Georgia in '79." ^ Chris Smith, Biographical Directory of the United States Congress. Accessed June 5, 2007. ^ Prunty, Brendan. "Rahway's Dexter Strickland enjoying quick basketball baptism with North Carolina", The Star-Ledger, November 19, 2009. Accessed April 23, 2011. ^ Staff. "Sagal adds edge to FX's new 'Sons'", Philadelphia Daily News, September 3, 2008. Accessed May 20, 2012. "Created by Kurt Sutter, a New Jersey native whose biography boasts that he was 'raised in the shadow of Rahway prison' and spent much of his childhood indoors, away from people, three feet from a TV screen." ^ Cheney, Margaret. "Tesla: Man Out of Time". Accessed June 5, 2007. "The Tesla Electric Light Company was formed, with headquarters at Rahway, New Jersey, and a branch office in New York. ^ Haley, John. "Q and A session with Marques Townes of St. Joseph (Met. ), what sport will he play in college? ", The Star-Ledger, January 28, 2014. Accessed March 26, 2018. "So that was the first thing I addressed with Townes, who grew up in Rahway, moved to South Amboy in the fifth grade and who now lives in Edison." ^ Warner, Bob. "Former Police Commissioner Kevin M. Tucker dies at 71", The Philadelphia Inquirer, June 20, 2012. Accessed July 6, 2012. "He was one of six children born to Irish immigrants William and Catherine Tucker. The family moved to Rahway, N.J., and Mr. Tucker attended St. Mary High School in Elizabeth." ^ a b Staff. "Vaches Now a Brother Act", St. Paul Pioneer Press, April 1, 1993. Accessed December 28, 2010. "The best place to freelance Allan figured is the New York area So he moved back to his and Warren's nearby hometown Rahway NJ." ^ Rodriguez, Alex W. "Jazz happenings for the week of Dec. 22", The Star-Ledger, December 22, 2010. Accessed December 28, 2010. ^ Johnson, Robert. "Looking Back Is Not an Option", The New York Times, November 28, 2004. Accessed October 19, 2007. "He is also promoting his new book "Medicine, Science and Merck" (Cambridge University Press), written with Louis Galambos, describing his path from son of a luncheonette owner in Rahway, N.J., to leader of a pharmaceutical giant." ^ Staff. "Carolyn Wells, Novelist, Dead; Noted for Mystery Stories and Nonsense Verse, Also for Children's Works Began Writing In Rahway Wrote 170 Books by 1937 and 70 Were Mysteries -- Widow of Publisher's Son", The New York Times, March 27, 1942. Accessed May 22, 2013. ^ Staff. "Rahway's Own, Shanice Williams plays 'Dorothy' in The Wiz Live", Suburban News, December 8, 2015. Accessed May 30, 2016. "On the evening of Dec. 4, the Rahway community gathered at the town's high school to celebrate the success of yet another of 'Rahway's Own', Shanice Williams, who won the coveted role of Dorothy in NBC's network television premiere of The Wiz Live!" ^ Rourke, Bryan. "At the Black Ships Festival: Saki, sushi, sumo and more", The Providence Journal, July 16, 2009. Accessed December 28, 2010. "Yarbrough, 44, of Rahway, N.J., is visiting Newport this weekend for the Black Ships Festival." Wikimedia Commons has media related to Rahway, New Jersey. Wikisource has the text of the 1911 Encyclopædia Britannica article Rahway. This page was last edited on 6 April 2019, at 01:48 (UTC).